A business that’s marketing-orientated focuses on the most decisive element of a company's success: the customer. This degree includes an exciting mix of creativity and strategy, offering the development of skills needed to thrive in a career that’s data-driven and digitally-led. Learn contemporary marketing processes, strategy and techniques through a combination of workshops, lectures and seminars: taught by industry-experienced tutors. In this degree you’ll be immersed in academic theory as well as practical industry experiences. Take on real-life briefs from global companies and take part in industry workshops, where you’ll spend time with our industry partners, including the global advertising giant WPP, L’Oreal and Unilever - the company behind Dove toiletries and Ben & Jerry’s ice cream! Welcome to a degree that provides a real-world perspective on how marketing strategy plays a central role in modern business. Develop the skills and knowledge base necessary to thrive in a variety of general business and marketing-specific roles, straight after graduation. You’ll work with industry giants leading the way in the marketing world through workshops at the Headquarters of companies such as Unilever, L’Oreal and Direct Line Group. You’ll study modern marketing modules, developed with employers and you’ll study modules like social marketing to give you the skills employers are looking for. You’ll be taught by industry professionals who have a wealth of marketing experience that they incorporate into their lectures and seminars. You’ll receive talent development sessions to get you ready for marketing in the real world after graduation. Marketing is one of the fastest growing industries and this course will prepare you for all kinds of roles, including marketing, PR, advertising, consultancy and management. Completion of this degree gives exemption to paper F1 of the Association of Chartered Certified Accountants (ACCA). You could also gain exemption from papers F2, F5, F8 and F9, depending on module choice – see Module Information for more details. All Business Management students study the same core module in their first year. This module introduces you to key business topics in the context of a real organisation. Our unique 60 credit module Principles of Business, consists of four interlinked parts which are designed to give you a holistic introduction to key business topics in the context of a real organisation, including finance, marketing, people, law, organisational behaviour and technology. Part 1 of the module focuses on the overall purpose of business, including the set-up and infancy of organisations. Part 2 gives a technical introduction to the pillars of business: finance, law, management, marketing and innovation. Part 3 consists of simulated placements where students are given the opportunity to apply their knowledge and skills by replicating tasks performed in the workplace by industry professionals. Part 4 brings together each of the pillars of business in the context of strategy, governance, ethics, and leadership before concluding with the end of an organisation’s life-cycle. Principles of Business is assessed in four parts over the course of two terms. The self-managed learning modules gives you the opportunity to demonstrate the use of your initiative and level of autonomy by applying your skills and knowledge to a specialist area which is of particular interest to you. As an example, you could draft a report in an area of interest not covered in the main syllabus, study a module at another institution (e.g. a language at another university), create a practical project by applying a topic in depth, write a report on work based learning on an internship, or complete a professional qualification. You can design some of your own learning, incorporate learning from other sources, or incorporate work- based or entrepreneurial activities. This will help to ensure that you have the confidence to take your learning and personal development further into new areas and emerging sectors, and will allow you to pursue your own unique interests. Once students have had exposure to the different areas of business in their first year then they can either choose or switch their specialism before the second year begins. We aim to have more industry involvement than any other Higher Education institution and you’ll really start to focus on building connections and gaining experience. There are lots of exciting industry projects from internships to trips abroad that you can be involved in. All Business Management students study these core modules in order to build an understanding of the central functions within an organisation. By your final year you will have developed a thorough understanding of the principles of business and will have had lots of exposure to real organisations, industry case studies and working practitioners. This final year is focused on bringing everything you have learnt together to solve real business problems.You’ll study a unique module called Principles of Business, introducing you to core business topics in the context of a real organisation, including finance, people, law, organisational behaviour and technology, as well as marketing (60 credits). We’ll challenge you academically, with inspiring, up-to-the-minute course content developed to give you the competencies that employers value. Best of all, we work with a wide range of professional bodies to make sure our degrees are aligned to their qualifications. So, as you study, you’ll gain exemptions from various professional business, management and finance examinations and have the opportunity to take professional qualifications. Each module contains at least one piece of practice or ‘formative’ assessment for which you receive feedback. Formative assessments are developmental and do not count towards your overall module mark. workplace, either individually or as part of a team. For example, report writing, data analysis, preparing strategies and presentations. You’ll also submit different types of coursework and sit written exams as part of the assessment for some modules. Apart from receiving feedback for your formative assessment, you will also receive feedback for your coursework and practical exams, and upon request, for your written examinations. In order to progress to the next stage (from first to second year, and from second to third year), you will have to achieve 120 credits at the end of the academic year. For further information, including pass marks and progression rules, please see the Student Handbook. Your overall workload will be divided between teaching sessions and independent learning. You will be taught through a combination of lectures, seminars and industry workshops. Seminars enable you to discuss and develop your understanding of topics covered in lectures in smaller groups. Industry Workshops, jointly led by an industry expert together with the academic tutor, will give you an opportunity to solve authentic work-related tasks to gain hands-on experience. You will be taught by an experienced teaching team whose expertise and knowledge are closely matched to the content of the modules on the course. The team includes both academics and professional practitioners with industry experience. Independent learning plays an important role in your academic development. When not attending lectures or seminars you are expected to learn by self-study. Typically, this will involve reading books and journal articles, working on individual and group projects, preparing coursework assignments and presentations, and preparing for examinations. You also have an opportunity to tailor your degree by choosing elective modules with a higher level of independent learning, including our Self Managed Learning modules which are available at every level. You will have an access to a variety of materials to aid you in your learning. At the start of your programme, you will attend a workshop on Good Academic Practice. Moreover, our OLE platform offers an online module focused on improving your study and research skills and academic writing. Finally, the Online library also offers an extensive range of literature on both study skills and academic writing. on the two-year accelerated programme attend classes during the Summer Term. See term dates. During one term, you will typically be attending four modules of 15 credits each. A taught 15 credit module consists of approximately 10 hours of Lecture content, 15 hours of Seminar content and industry days. On top of this, you will be expected to spend around 100 hours on independent learning as a preparation for the module. More information can be found in our Learning and Teaching Strategy 2017/2018. If you choose independent learning electives (such as Self-Managed Learning), you will usually attend one hour supervision per week. This means, that per week, your overall workload will be approximately 40 hours, typically, you will spend 4 hours in Lectures, 10 hours in Seminars and 26 hours on independent learning in each. Moreover, you will attend four industry workshops per term. Typical entry - 120 UCAS points and interview. Our UCAS tariff entry is 120 points or above which is equivalent to BBB at A level. If you have, or are predicted to get, those grades/points, we still invite you for an interview. We want to find out more about you and make sure the course you've chosen is right for you. Just as important, it's also a chance for you to find out more about us. We also welcome applications from students who have studied (or are studying) the International Baccalaureate, Access to Higher Education diplomas, Higher National qualifications, BTECs, Scottish Highers, Cambridge Pre-U, Welsh Baccalaureate and equivalent non-UK qualification. You can calculate your UCAS points by visiting www.ucas.com/tariff-calculator. Please note that applicants will still need to attend a Professional Workshop to be awarded our partial fee waiver. If you do not have the UCAS tariff points you need, or traditional entry qualifications, you can still apply through our assessment-based entry route. You’ll be invited to a Professional Workshop, where you’ll take part in four tasks (including an interview) to help us assess your suitability for the course. Your performance at the Workshop will determine whether we can offer you a place on our programmes. If you'd like to study at Pearson Business School full-time, you'll need to apply through UCAS. Our institution code is P34. If we make you an offer for a place on the programme, it will be subject to our Terms and Conditions. This degree is designed to give you the skills you need to succeed in the marketing industry and the wider business world. Our graduates have gone on to work in a range of roles at different levels from Assistant Brand Manager at Nestle to Marketing Manager at Moto-Lita Ltd.
Francesca Ferguson, graduated in 2017 with a BA (Hons) in Business Management with Marketing, straight into a managerial role in marketing at Moto-Lita Ltd. She believes Pearson College London encourages you to “push beyond your comfort zone, challenge your skillset and build your business network”. For more advice and information on careers, download our Careers Guide. Visit our finance pages for more information on fees, funding and scholarships. In addition to your tuition fee you will need to budget for your living costs and some other costs associated with your studies. An additional re-attendance fee of £750 per 15 credit module is charged if you need to repeat a module. Pearson Business School has a “bring your own device” policy: you will need to have your own laptop or tablet computer to access the learning materials on the Online Learning Environment, as well as the books, journals and databases available from our online library. The cost of a laptop or tablet varies according to your personal preference but we have prepared some guidance on the specification to choose. At our Midtown campus you will have the benefit of access to free printing and photocopying facilities. However, you will have to purchase, notebooks and other ordinary stationery items. You may wish to purchase your own copies of the recommended textbooks, but please note that all textbooks are available to students in electronic editions. If you will not be living at home, you will need to pay for accommodation. For up to date details of Pearson College London’s accommodation partners and estimated rental costs, visit our accommodation pages. You will incur transport costs travelling to your classes and to events, such as industry workshops, which may take place elsewhere in central London. Details of public transport costs are available from the Transport for London website. There may occasionally be an optional opportunity for you to attend an event outside central London for which you would need to pay the transport costs, should you choose to attend. Request a copy of our new undergraduate prospectus for 2018. Can't make it to an open day? Take a virtual tour of our Midtown campus. Every aspect of your degree programme will be shaped by the employers we work with and you'll get the chance to learn directly from them, helping you develop the skills, qualities and experience you need for your career. All of our degrees are designed through our unique approach which brings together leading figures from business and academic communities to design degrees that are relevant to employers. Our programmes have been developed with input from industry partners, including Unilever, Lotus F1, IBM, WPP - a world leader in marketing communications, Lloyds of London and leading law firm Gowling WLG. Employers get involved in the actual delivery of modules too, so there’s a wide range of industry activities and projects that you can be part of. You’ll visit the HQ of some of the biggest companies in London, be taught by professionals through industry workshops, attend a yearly conference and have the opportunity to work with a mentor with an industry background. 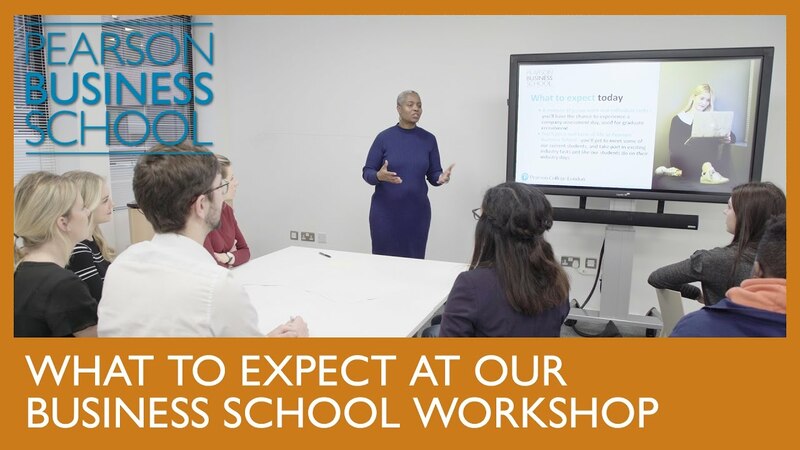 That means you’ll get direct exposure to hugely successful real-world businesses and business leaders, through regular industry workshops, termly industry conferences and a yearly residential event. Previous workshops and conferences have been hosted or run by Unilever, Savills, IBM, Direct Line Group, L'Oreal and Salesforce, to name just a few. study within the heart of a FTSE100 company, in Pearson's offices in the heart of central London, a little different from the average university campus! learn about business as it really is, fast-paced, global, exciting, challenging and forever-changing and our workshops and events with industry give you the chance to show up and shine! also have a lot of fun along the way! I enjoy living in London as there are so many free events and talks to go to. I love the way you can hear so many interesting people right on your doorstep who inspire and help shape my degree.